Exciting news! We’re busy building an all new state of the art Audi centre, for a planned move this summer! For Audi cars and services in Bolton, Jardine Motors Bolton Audi is perfectly placed. Visit our showroom on Mill Street to browse and test drive the latest models, or to restore your car to its best with our expert servicing. Drivers of Audi cars can visit Bolton Audi for MOT testing, vehicle health checks, standard servicing or to draw up a service plan. We also offer accident management, for vehicles and drivers in need of extra help. And the parts and accessories that we can fit to your car are all authentic Audi components. If you do not yet own an Audi, or want to upgrade, you can visit our showroom for the latest Audi models. Brand-new cars are available, as is a wide selection of approved used vehicles – from clearance and pre-owned cars to ex-demonstration vehicles. To arrange a test drive please contact us; our selection includes the Audi A4 and the sporty TT model. As a partner of the Motability Scheme, a range of Audi cars at Bolton Audi can be adapted for qualifying drivers. These cars can be funded on the Scheme, to provide greater mobility to disabled motorists and their families. We also offer fleet services, so if you require advice on the management of your fleet, or are interested in any of our Audi business vehicles, please get in touch. Special offers and regional promotions are also available, to help make the cars and services at Bolton Audi even more affordable. Our variety of flexible financial solutions helps individuals and companies to afford their Audi cars – we can advise you on which kind of lease makes the most sense for your budget. To find out more about our services and Audi cars, please contact the friendly Bolton Audi team today. Our dealership is open long hours for your convenience, and if you require our sales department you can even visit on Sundays. With an excess of 20 years’ experience in the Premium Automotive Sector I am passionate about leading a team that strive to constantly deliver exceptional customer service. This sits perfectly with the Jardine Motors Group and Audi values and hence why I joined Bolton Audi in January 2018. 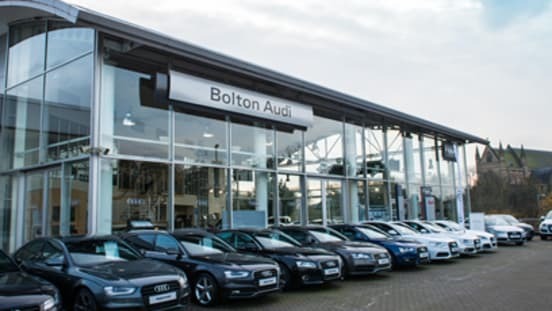 Whether you are visiting to purchase a vehicle or having work completed by our After Sales colleagues, entering the premises of Bolton Audi will feel like a business that looks after you like ‘one of the family’. It is a fantastic time to be associated with the Brand, there is a comprehensive model range that really does cater for everyone.With the motoring heritage and history unique to its contemporaries, it is enough to inspire anyone lucky enough to work for and represent this motor manufacturer. My favourite car is the SQ7 with it’s fantastic looks, a classy interior, balanced ride and seven seats add to this the impressive handling and sports-car acceleration - it ticks all the boxes of a premium SUV. I have over 30 years’ experience working with prestige brands and believe passionately in delivering a 5 star experience to all our customers whenever they visit Audi Bolton. I am the newest member of the team having joined Jardine Motor Group in early January 2019 . I have been extremely impressed with the model range and believe Audi to be a truly aspirational and inspirational brand. I am currently driving an A7 Quattro which is a technically sophisticated vehicle and a really fantastic drive. I am a keen walker and I can be found most weekends walking the fells on the Lake District. I’ve worked for the Volkswagen group for the last 38 years. Starting my career as apprentice parts advisor, working my way through a number of roll’s within the parts department including a period as Parts Sales Rep. I settled in to the roll as parts manager in 1994, gaining accreditation with the Volkswagen group in 2009.I’ve enjoyed managing various teams ever since. I made the moved from Volkswagen over to Audi in 2016, and recently moved over to Jardine motors where I’ve been welcomed with open arms. My passion for the Audi brand is what continues to drive me. There are so many Audi models I love, but if I had to choose it would be the SQ5, It’s got everything you need in a car, Looks, comfort, & performance.